Based on lots of customer feedback, we’ve just added another new feature to PearBudget. You can now start your budget on any day of the month. So your budget can run from Oct 19-Nov 18, or Oct 3-Nov 2, or whatever works best for you! You can change your start date by clicking on the “your account” link up in the right hand corner of any PearBudget screen. We’d love to hear how this feature works for you; our e-mail address is help@pearbudget.com. 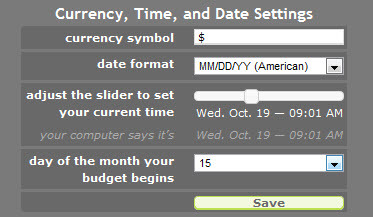 i see how to set the day of the month — but not the month itself…….I just joined and want my annual budget to start on March 1, 2012…..is that possible? We don’t currently have the ability built into PearBudget to allow you to change the start date of your budget year. That’s a great suggestion for improvement though, I’ll definitely add that to our list!